For a meal that is mouthwateringly good, visit Mesero for lunch. Be warned, the delicioso dishes we’re about to detail are likely to prompt a rumbly in your tumbly. Munching on one of our community, appetizer-style dishes can make for the perfect option for lunch. Our shrimp ceviche is a perfect, citrus-marinated, option. Tiger shrimp is served with jalapeño pepper, heirloom grape tomato, green onion, avocado, and fresh cilantro. You can’t go wrong with a couple (or a dozen) tacos for lunch. Two of our favorites are our brisket tacos and our crispy “dailey” fish a la playa. Oven-roasted and slow-cooked, just thinking about our brisket is making us drool. 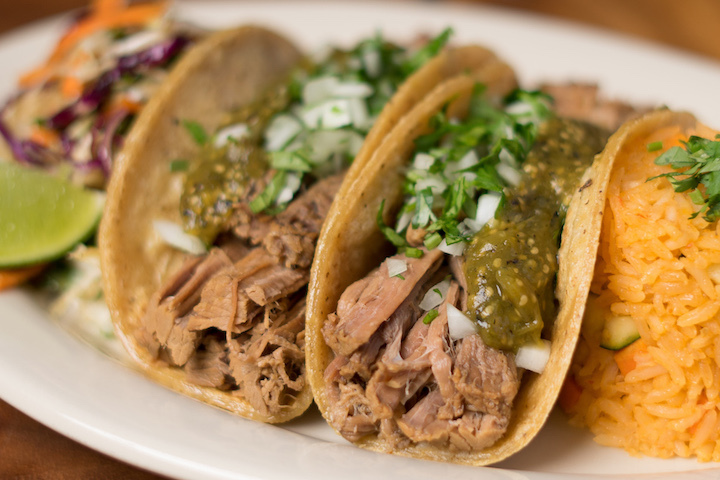 Served with tomatillo sauce, queso chihuahua, onion, cilantro, mesero slaw, and arroz rojo, they are a perfectly well-rounded option. For those preferring a fish option, give our crispy “dailey” fish a la playa a try. Our fish of the day is tempura battered and served with roasted corn, tomato, jalapeño ranch, mesero slaw, and arroz blanco, yum! Our salads are the perfect antidote to a weekend of overindulging. Our cazera salad is the perfect option if you’re looking for a salad that’s refreshing yet filling. Served on a bed of romaine lettuce and mixed greens, it’s topped with applewood-smoked bacon, red onion, heirloom grape tomato, roasted corn, avocado vinaigrette, queso de oaxaca, and tortilla strips for some crunch. For a lighter salad option, opt for the hollywood cobb salad. Also served with romaine lettuce and mixed greens, it’s the perfect blend of applewood-smoked bacon, egg, avocado, heirloom grape tomato, and tortilla strips. It’s tossed in a jalapeno ranch dressing that has the slightest bite. We’re dishing up tons of food you’re sure to appreciate, whether you’re visiting us for brunch, lunch, or dinner!